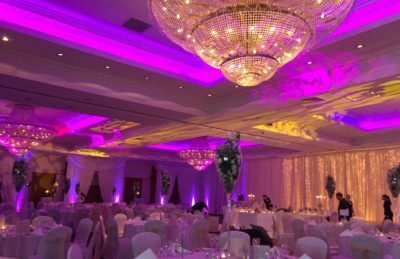 Wedding Hotel interiors in most hotels in Ireland have now a lot of wedding accessories already. This will benefit you so you don’t have to separately hire in these items. This allows you additional budget to decorate. 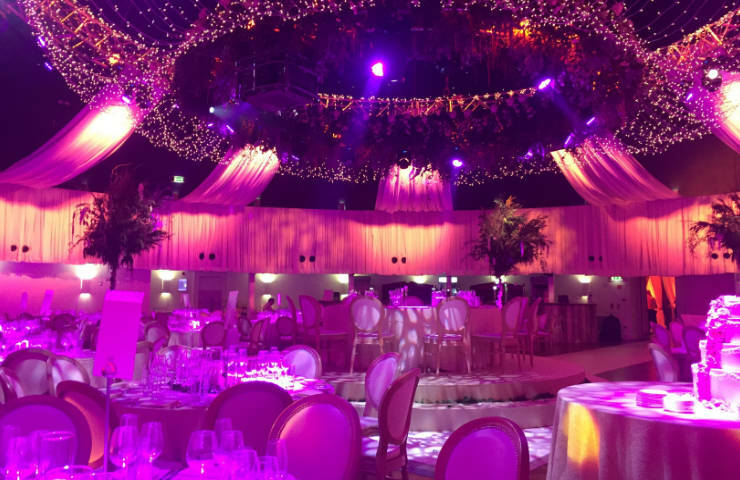 In addition, everything from a red carpet walkway with ropes and rails, high pod tables with nice linens, adding 3ft tall candelabras, table linen that will reach the floor and hide the legs of the table which is especially relevant, also LED uplighter and some will have the fairy light backdrop in place. Additional accessories are for your personal touch. 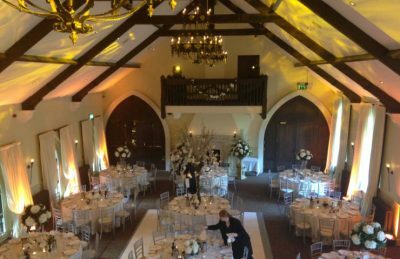 By adding a fairy light dance floor, new chairs, flower walls, a photo booth or pipe and draping, your reception are your special touches. Our challenge is to additionally enhance the interior of the hotel. 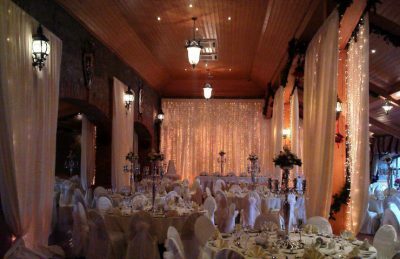 We do this by concealing the hotel interior which would suit the corporate client but not the neutral pallet of a bride & groom. Transforming your wedding venue interior is done with ease and comfort with White Events. It is important to choose the supplier who will complete your vision to the highest standard. Our team will add cherry blossom trees mounted as table centrepieces to complete a fairy light backdrop with a dimmer control. We especially like Mac 550’s lights. These are especially relevant to create texture and atmosphere to a plastered ceiling. They also add atmosphere to the evening. We also decorate top tables with flower walls. We have fairy light dance floors which can have your initials centred on the floor. 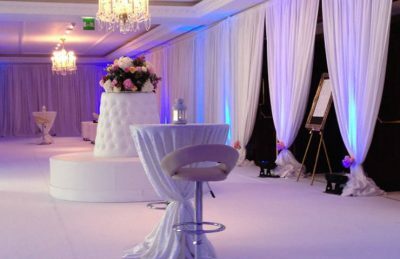 Draping your hotel is also available as a rental. We dress rooms to go full room height. We can decorate in ivory or white fabric (or any colour of your choice), to complete your setting. 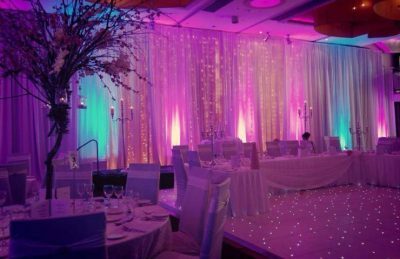 Most of all, working with your hotel wedding team is important. We have 22 years experience in weddings and make any situation easy and problem-free.